‘Small Is Beautiful‘ comes from a collection of essays by British economist E. F. Schumacher, first published in 1973. Championing small organizations, believed to empower people, asserting that ‘people can be themselves only in small comprehensible groups’, it strongly contrasts with “bigger is better”. Does this concept apply to innovation? Whether you look at start-ups fortunes and ‘lean start-up’ approach, spot the ‘2 Pizza team’ practiced by Amazon, or read the analysis by @scottdanthony about the ‘New Corporate Garage’ (‘catalysts using big company resources to develop solutions at global scale), status is clear: small teams are better to achieve breakthrough innovation. Nevertheless smallness is not enough to succeed. How we can enhance the actions of small innovation teams, and support them in their progression is what we are tackling here. Shaping deliverables in modular design mold, to unleash collaboration. Modularity establishes your innovation capital: modular deliverables facilitate acceptance, letting others build value on top of your platform; modularity is a toolbox for design. Actually, even if your innovation fails, modules that you have designed will be reused by other innovation teams, linking innovation teams to one another, activating the intelligence of the many through a living capital. Assuming our innovation team performs, we might want to scale, pursuing multiple innovation tracks concurrently. How do we achieve consistency, cross fertilization, and overall efficiency in the organization? Innovation portfolio and cooperative governance can help. ‘Balanced, inspired, staffed, dynamic, transparent, scalable’: that’s what your innovation portfolio should look like, as ‘a jewelry case to your innovation project’. If innovation teams are well set, ‘they won’t feel like employees working for someone else, they will feel much more like belongers as Richard Branson descrives. A savy innovation portfolio is here to infuse a sentiment of ‘belonging’. Probes are illustrating future trends, materialize ideas through demonstrators, support the conversation about new concepts, and will eventually feed the projects pipe. Once every team finds out its position, how to link teams to one another, and activate the flow of natural communication? “Related squads are grouped into tribes, behaving as “incubators”. Tribes hold informal gatherings on a regular basis, showing what they are working on, what they have delivered and what others can learn from what they are currently doing. 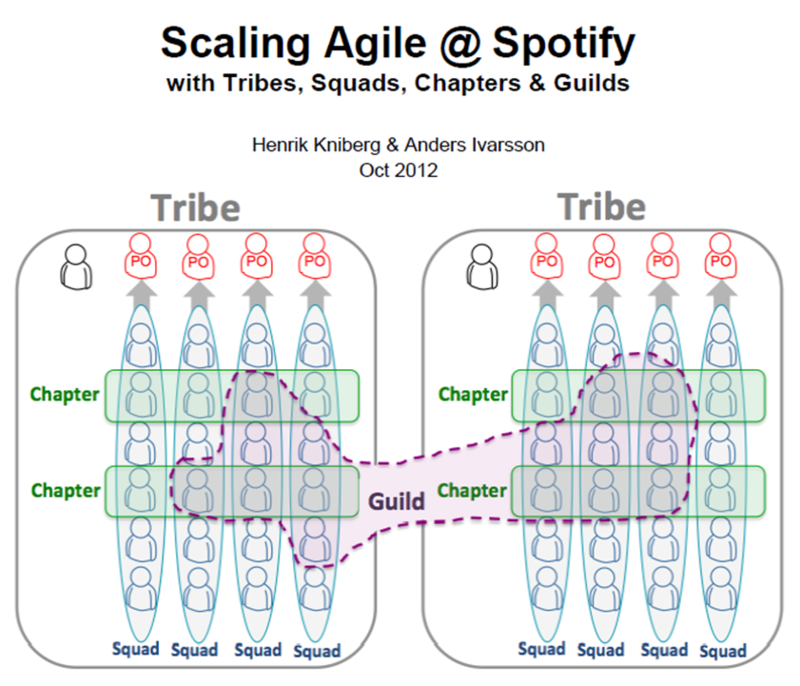 “Tribes interact rarely; for specific projects, synchronization meeting called “scrum of scrums” is set-up on demand. Heading small innovation teams is somewhat familiar with API design-thinking: it involves meaning, target, expandability, scalability, and innovation ecosystem. One could think of managing small independent innovation units like processing API: harnessing collaborative innovation, streamlining seamlessly community energies, building a whole connecting functional legos, and initiating new service streams almost instantly by linking.